As summer comes to a close and the colder weather drives more and more people inside throughout the month of October, Six Flags Over Georgia only stays open on weekends. Nevertheless, the 290-acre theme park is arguably most entertaining during this final month of operation, due to the annual Fright Fest. From terrifying haunted houses to trick-or-treating kids, the entire park is transformed into a spooky celebration of the fall and Halloween seasons. Upon entering the park, the Fright Fest decorations immediately set the stage. As expected, the customary pumpkin and fall decorations litter the walkways and common areas. Yet even before guests pass through the gates, there exists an air of mysterious and unnerving excitement. Actors dressed in detailed monster and horror film character costumes roam about—this year, the theme is a park-wide zombie infestation—scaring passers-by and interrupting family photos. Eerie music echoes throughout the park; cobwebs cover the entrances to rides. Turning the wrong corner may lead straight to a perfectly-staged scene from a horror film, all the while, Six Flag’s 11 roller coasters rumble and invoke intense screaming above the Halloween atmosphere below. This is Fright Fest. During daylight hours, the park entertains its younger visitors with trick-or-treating, spooky storytelling, arts and crafts, kid’s costume contests and more. However, this does not mean that fear-seeking adults must wait until dusk to be entertained. Nearly all of the major rides and roller coasters have spine-chilling adventures, where different monsters and ghosts of the ride’s past show up to scare the riders. The cheesy comedy shows that line the walkways between rides are replaced by horror story plays and parties. While still comedic in nature, these Monstertainment shows are not all for the faint of heart. 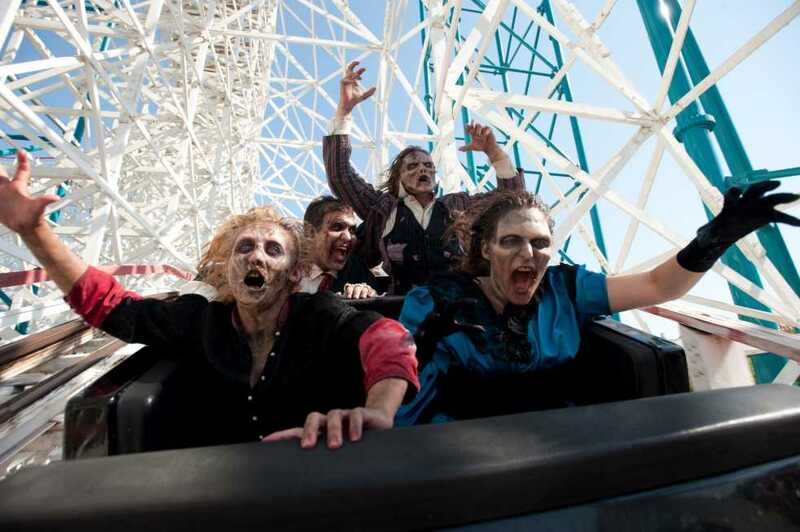 As always, though, Six Flags hosts a number of haunted houses and ghostly rides for the real fear-seekers. These “Fright Areas” almost all cost extra, as their installation, operation and staffing is obviously rather pricey. The main haunted house, Dr. Fright’s Frightorium, rivals the size and scariness Georgia’s number-one haunted house, Netherworld. The Frightorium is a dark walk-through house with live actors and props more than capable of scaring even the most veteran haunted house enthusiasts. The park’s second most popular horror attraction is the Terror Train—a locomotive ride around a secretive ghost town, built by Six Flags only for the month of October, known as Bloodtown. Once again, live actors and narrations make the ride very authentic and rather scary. As with the Frightorium, the Terror Train costs extra. Six Flags also features other fright areas such as Terror Trail: Backwoods Bloodshed, Kill Island, Scare Zone and Asylum. The annual tradition of Fright Fest at Six Flags attracts thousands of visitors every year. Many Georgia residents reserve their yearly theme park trip for the month of October for this reason alone. Visitors really get the best of both worlds—an awesome theme park and an extensive Halloween fright experience. Whether one is a horror film, fear-seeking aficionado or the average roller coaster- and thrill-lover, Six Flags in October is the place to be.